Individuals from legislative branch agencies working on the digitization of legislative data, academics, consumers of legislative data, and transparency advocates came together for the sixth annual Legislative Data and Transparency Conference (#LDTC18), hosted by the Committee on House Administration and held July 12, 2018, at the U.S. Capitol Visitor Center. A recording of the proceedings is available at cha.house.gov/LDTC18. Much of the day was devoted to reviewing how laws are made and how technology is improving access to current, accurate, and complete legislative data. Panels highlighted the significant progress of modernizing the legislative process, making the products of Congress available while furthering transparency, openness, and engagement with the public. Robert Reeves (deputy clerk of the U.S. House of Representatives) described projects that focus on making bills, bill summaries, and bill status information available for download in bulk format. A new Office of the Clerk website makes the House live stream video available; by the end of 2018, member committee profiles will be updated and search capabilities will be added to the video archive. Kirsten Gullickson (principal analyst for the Office of the Clerk of the House of Representatives) described how her team developed a solution that illustrates the changes a bill is making to current law, as well as provides document-to-document comparison between two versions of bill language. Comparative prints are available in PDF and HTML for some bills in the Bills to Be Considered section of docs.house.gov. (See the image for an example from the week of June 25 that compares H.R. 2083 with Rules Committee Print 115-79. 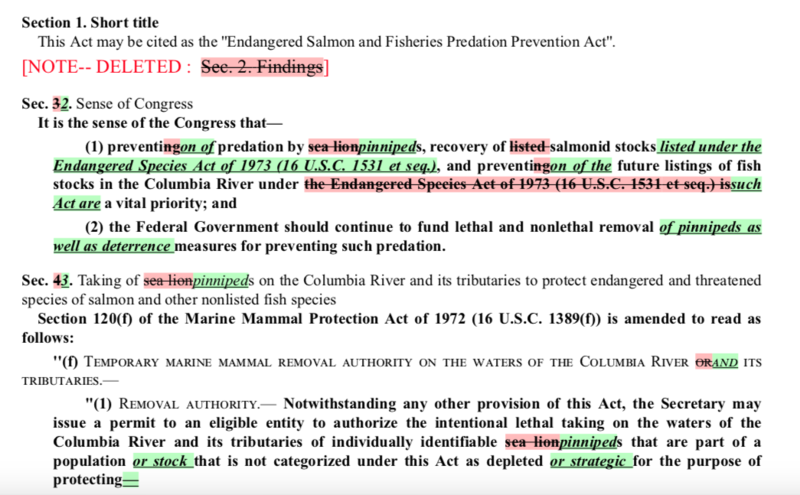 Omitted text is stricken and highlighted in red, and proposed text is underlined and italicized and highlighted in green.) The long-term vision is to be able to deploy a platform that can create on-demand static comparative prints illustrating the changes between two versions of a document; current law and that law as proposed to be changed by amendments; and a bill or resolution and that bill or resolution as proposed to be modified by amendments. Lisa LaPlant (FDsys and govinfo program manager at the U.S. Government Publishing Office [GPO]) said that FDsys is set to retire in December, so “update your bookmarks and links to govinfo.gov.” (Immediately before FDsys is retired, redirects to govinfo will be enabled.) govinfo provides Release Notes that detail digitized documents and site improvements. Some of the highlights of recent releases include the addition of a “related documents” feature and digitization of the Federal Register back to 1936. Be on the lookout for additional materials from Federal Depository Library Program institutions to be made available via the site. The Statute Compilations Collection project, whose goal is to provide a uniform set of laws in the U.S. Legislative Markup (USLM) standard to enable downstream processes and increase efficiencies. The PDFs will be available on govinfo this summer; during FY2019, we will see legacy XML files converted into USLM and provided as bulk data. Andrew Weber (part of the Office of the Chief Information Officer at the Library of Congress [LC]) discussed updates to Congress.gov. New content, features, and enhancements appear monthly. Recent improvements include the Committee Authority Project, which aims to upgrade access to committee information (including for terminated committees); increasing the number of items that can be downloaded; an updated Introduction to Search page; active links to previous committee meetings; and an option to subscribe to email alerts for updates on the site. For the initial public release, the Library will make available in PDF format all of CRS’s R-series of ‘active’ reports that were published since the enactment date, as well as the Appropriations Status Table. The publication directive specifically mandates that the public website is to be ‘updated contemporaneously, automatically, and electronically, to include each new or updated CRS report released on or after’ the date on which the Library makes the website available for public access. The Library and CRS will ensure that every CRS report that is published or updated once the public website is active will be so included. The Library and CRS are additionally committed to presenting the full inventory of reports appearing on CRS.gov on the public website as soon as is practicable (with a full migration targeted for completion by spring 2019). After the R-series reports are published, the Library will work to make other written products, such as In Focus products, available. Speakers on the panel Lifecycle of a Legislative Provision—Why Standards Matter discussed the importance of using a common data standard for the exchange of legislative information. USLM addresses the presentation of the document, its structure, and what it means and is interoperable with legal document markup language international standards. Given the iterative process of creating law, with revisions passed back and forth, and the number of entities involved in making the law available—including the House, Senate, LC, and GPO—the ability to classify documents, prepare text (with editorial notes), and publish online and in print while following standards is key. For further progress to be made, a cultural shift is necessary, with greater discipline needed to keep the law current as new provisions are introduced. Eric Mill (senior advisor at the General Services Administration’s [GSA] Technology Transformation Service) moderated a panel focused on APIs and interoperability. It began with an introduction from Jon Quandt (program planner at the GPO) to the newly launched govinfo API. Kate Zwaard (director of digital strategy at the LC) illustrated how labs.loc.gov’s LC for Robots page offers users “starter scripts” in case they aren’t tech savvy and how its Experiments page can inspire the public by showing what’s been possible for others. Nick Muerdter (a software engineer at the Department of Energy’s National Renewable Energy Laboratory) explained the free, open source, cross-agency API management service offered by GSA. It helps federal agencies take care of the middle layer between the agency API and the internet. The service provides a cohesive, coherent API experience for users so the public need not hunt down agency data.